Regis Philbin: [to every contestant] Is that your final answer? BEING THAT TIMING is everything in Life, this quiz show series surely must have a perfect sense of it. Bowing on the ABC TV Network on Sundays (we think), it started out like the proverbial "Ball o' Fire" and quickly gained momentum. In a silent testimony to its power and unexpected success, prime-time quiz game money giveaway $how$ made quick appearances on CBS, NBC and FOX Networks all. THE SHOW'S APPEAL and popularity were no haphazard case of dumb luck. It is obvious that careful planning and calculation went into the program's format, content and overall appearance of this production. No element was overlooked. FIRST OF ALL, we see the framing of the appearance on the TV screens done up on a grand scale. Rather than having contestants appearing side by side with the MC/Quizmaster, the competitors are put into a sort of 'Roman Coliseum' arena of variable and sweeping beams of concentrated lighting. Much in the same manner of the Gladiatorial combatants, the challenger meets his foe (Quizmaster) face to face. IN ADDITION TO this careful, micro-management of the lighting, we have both the obvious and subtle use of computer controlled recorded music. There is both incidental musical queues and the constant deployment of background mood manipulating instrumental and vocal soundtrack. Mood and "excitement" were very closely manipulated in this manner. THE WORD THAT we are looking for is "Subliminal"; as the soundtrack quietly added the element of the dramatic and elevated our anticipation of excitement in this way. EMPLOYMENT OF THE direction of the show rendered its overall running time and the highly dramatic pacing of the proceedings is done up to the maximum. Use of friendly chit-chat (interviews) with guests and timing of segments with stopwatch precision allows the padding out of the show to a full hour; where all ceremonies could probably be said and done within the confines of the 30 minute show limit. 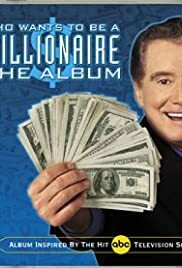 CAPPING OFF THE totality of this late 20th & early 21st Century mega-hit was the ascent of Regis Philbin to the Throne of Ruling Potentate and overseer of all proceedings of the day. The highly durable Mr. Philbin was the perfect man for this position. Witty, energetic and always in control, he also possessed a genuine liking of the people who came to compete. FOR SOME MONTHS after its initial show hit the airwaves, WHO WANTS TO BE A MILLIONAIRE was number one with the public. It was the topic of discussion around the old water cooler at many a break time. BUT THEN, AS it seems much like all other "sensations" of the small screen, the novelty wore off. But this original, prime-time series ran from 1999-2002, or a healthy and respectable three seasons. IT WAS FOLLOWED by the syndicated half hour version that went from 2003 until the present.